Opinion: Which digital camera is best? Many years ago—back when “digital camera” meant your images had the date and time stamped on them in that lovely LED font —I owned a 35mm single-lens reflex film camera. While I loved the picture quality, I grew tired of the work involved in setting up the camera to get those great shots. I also didn’t like lugging around all the gear—spare lenses and film, primarily. So at some point in time, I migrated to a “consumer” 35mm camera that had only a couple of modes to choose between and no lenses to swap. When digital cameras came out, I stayed with the same “consumer” type cameras, preferring the small and light pocket digital cameras over their full-sized cousins. As of late, my camera of choice has been the Canon PowerShot SD400 ( ). It’s so small and light, it goes nearly everywhere with me, and it takes what I thought were decent pictures. 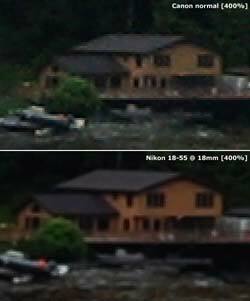 However, the small digital cameras are generally limited to a 3x optical zoom, and I’ve often found myself wanting a better zoom. I also enjoy landscape photography, and wanted something that would let me get some better macro shots of the flowers in our garden. Because of these issues, I’ve been mulling over returning to the SLR world for a few months, but hadn’t actually done much about finding out which camera I’d like to buy. Then something very lucky happened: Ken Smith of Glazer’s Camera arranged to bring a bunch of rental camera gear on the recent Mac Mania / Aperture Geek Cruise. Even better, Ken was making the equipment available to the Geek Cruisers for free , and he brought a lot of really nice stuff. As much as I was tempted to request the $4,500 EOS-1D Mark III, I figured my actual budget was going to be substantially lower than that when I did my post-cruise shopping. For those like me—rank amateur photographers who might be contemplating stepping up to a digital SLR—I thought I’d offer my opinions on how the DSLR compared to my pocket camera. Please keep in mind that I’m a total novice photographer—I’m relearning all the technical lingo after many years of not worrying about such things. So this isn’t going to be like reading a review on a high-end photography Web site. Instead, it’s simply my thoughts on both the cameras, along with some images to help illustrate a point or two. The biggest advantage of my Canon PowerShot SD400 is its small size. If I don’t want to carry around the case (which holds an extra battery and memory card), I can slip the thing in a pocket and oftentimes almost forget its there. As a result, it goes almost everywhere with me, and so I’ve managed to grab some pictures that I otherwise would have missed. At 5.0 megapixels (2,592-by-1,944 pixel size), it’s got enough detail to print crystal-clear full-page 8.5x11 images, and they’ve always looked great to my eye. The camera also has a very nice movie mode, capturing movies at 30fps at 640-by-480. The movie quality is quite good, though it obviously pales next to a real DV camera—but again, because I have the camera with me, I’ve recorded movies of things that otherwise would have slipped by into the past. As but one example, our daughter Erica’s first steps were captured on a pocket camera, because that’s what I had with me when she first let go of the sofa and started teetering across the floor. I’ve owned the SD400 for about two years, and I think it’s a wonderful camera. 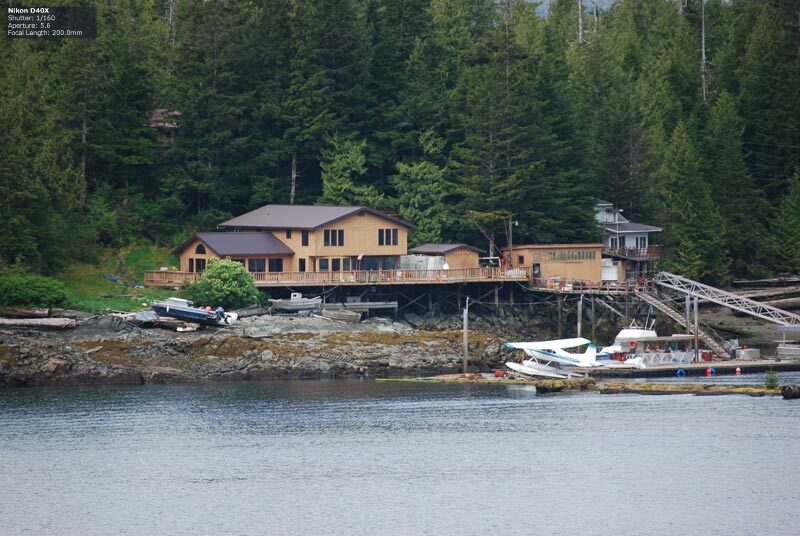 However, there are some things it lacks, even beyond the limited zoom as noted above. 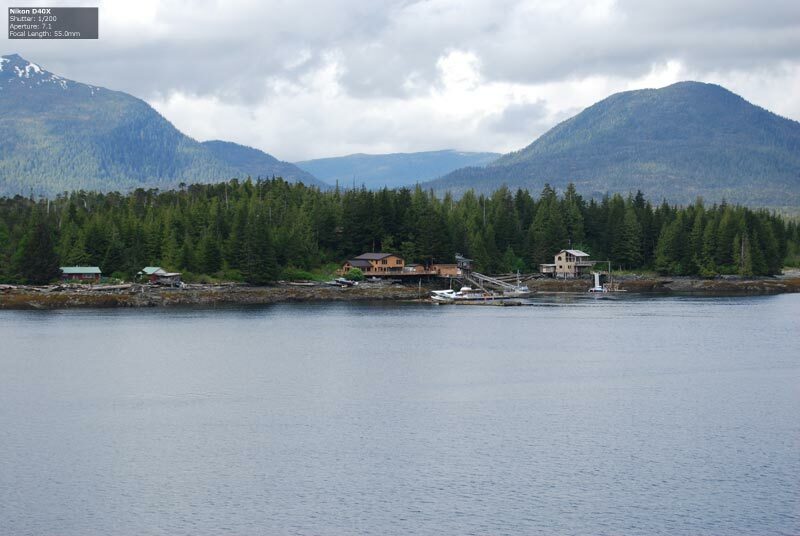 First, it doesn’t have a RAW mode, so every image has been compressed to some degree. I’m no photo perfectionist, but it seems that a camera’s job should be to capture everything as it sees it, then let me tweak the image data when I get home. RAW mode lets you do just that. Second, things happen slowly on this camera (and most other pocket cameras I’ve played with). The camera takes a half-second or so to turn on, and then running the zoom takes about a second if I’m zooming in to any extent. Getting the auto-focus to lock can take more portions of a second. And when I finally press the shutter, it seems there’s a small delay there as well. Add it all up, and if I’ve only got a second to get the picture I want, the chances are good that I’ll miss it. Adjusting between shots, you go through everything again—the slow zoom change, the slow auto-focus, and then finally the somewhat slow shutter release. Finally, it is a pocket camera, which means the number of modes available is somewhat limited. It’s not as bad as my first film-based 35mm consumer SLR camera, but it clearly isn’t a camera that was designed for those who want to tweak their image settings all that often. Moving from my pocket camera to the digital SLR, the first thing I noticed had nothing to do with the image quality. Rather, the first thing I noticed was the speed. 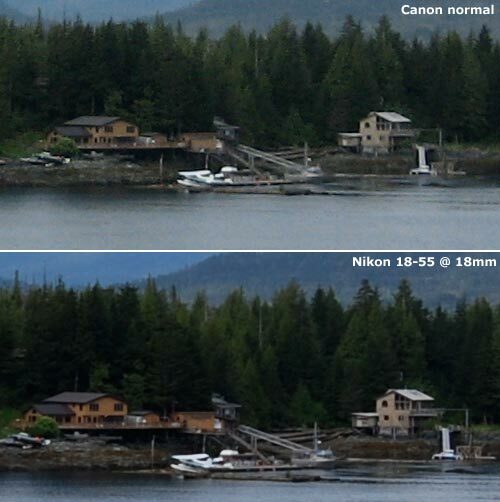 The Nikon (and any other digital SLR) is very fast. You set the zoom level the old fashioned way, by twisting a ring on the lens. So there’s no waiting for a small motor to move the lens in and out. Once you have the zoom set, auto-focus happens in a split second as you depress the trigger—the Nikon shows you three small squares on the screen, and one of them will light up red to indicate its status as the chosen auto-focus target. Keep pressing the trigger, and the lens releases a split-second later. Repeat as quickly as you wish; unless you’re shooting in tough conditions (very low light with a flash), the camera will easily keep up with you. 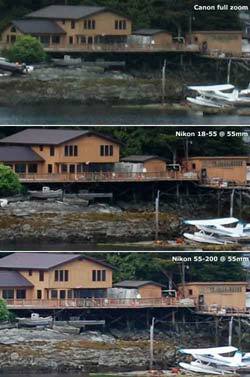 The Nikon’s multi-image mode will snap off six 10-megapixel images per second; my pocket camera can manage only about three 5.0-megapixel images in the same time, and then only if conditions are perfect. There are 10 images in that sequence; the first was captured at 8:07:58am, and the last just three seconds later at 8:08:01am. 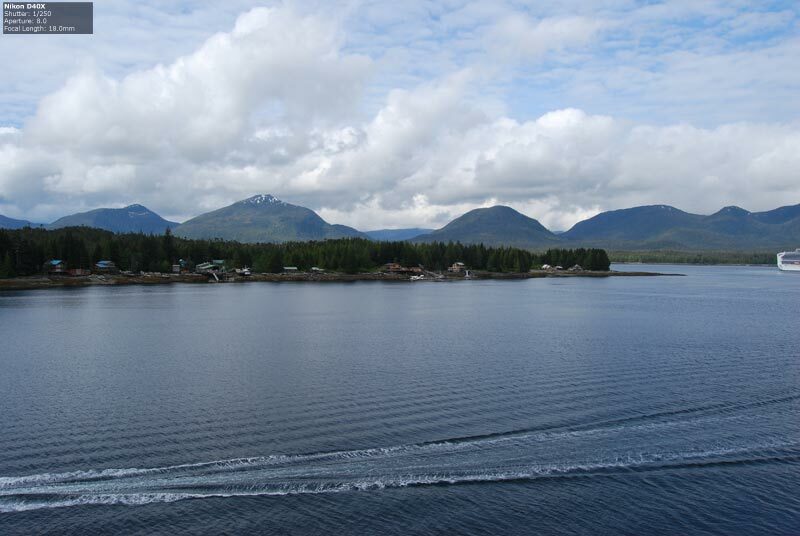 I was then able to look through all 10 pictures and find the one I liked the best for use in the Ketchikan blog report. I never would have even tried this with my pocket camera, for two reasons. First, the zoom wouldn’t let me get anywhere near this close, and second, even in rapid-fire mode, issues with the time required to auto-focus would pretty much ensure I didn’t get 10 images (and some of those I did get would probably be out of focus). I can see now why programs like Aperture and Photoshop Lightroom are popular with the pros—being able to easily group these related images together is something that would ease the management of so many pictures. As mentioned earlier, I took more than 700 pictures with the Nikon over the span of four days. If I had only my pocket camera, that number probably would have been about 250—or less. More is not always better, but in this case, having more shots from which to pick one or two keepers really is a good thing. Canon PowerShot SD400: Zoom all the way out, and zoom all the way in. For the full-size images, I’ve chosen to publish JPEGs with a fairly high degree of compression, just to keep the file sizes down. However, I did side-by-side comparisons with the originals, and there are actually very few JPEG artifacts added by the compression. What you’re looking at is a very good representation of the originals. Still, if you’d like to see the originals for yourself, just drop me a line and I’ll send them over. View the full-size version of those pictures, and you’ll see that the Canon exhibits quite a bit of noise. 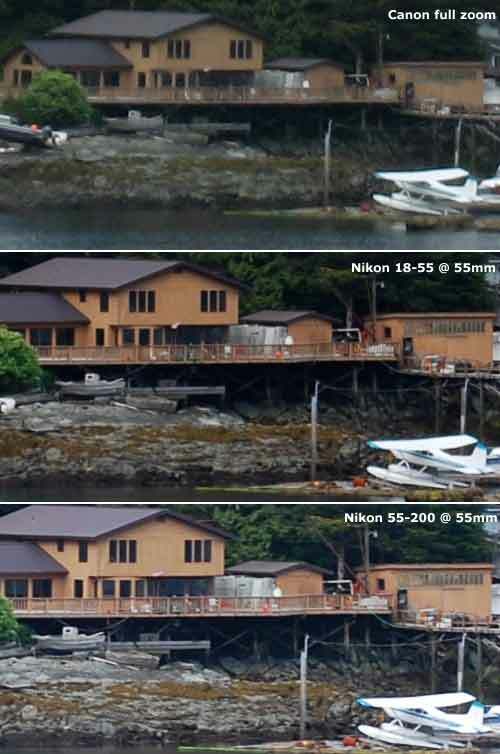 In the “normal” mode pictures, the roof looks like a patchwork of gray and black on the Canon, while it’s a nearly uniform dark gray on the Nikon. 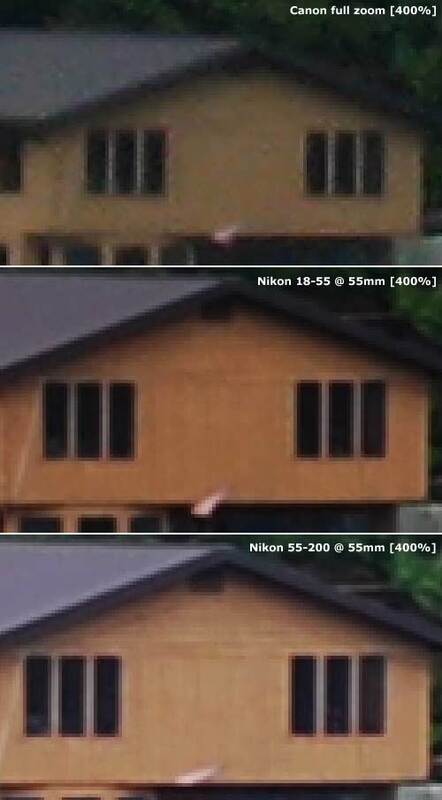 In the “full zoom” picture, notice that you can’t see any detail on the paneling in the home, whereas the Nikon images clearly show horizontal siding and vertical panels. 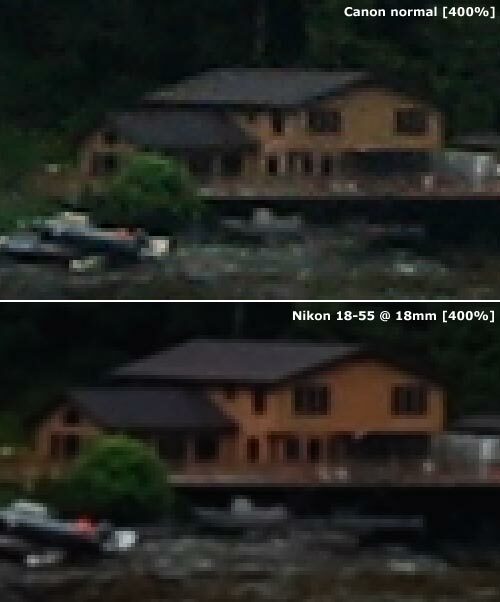 There are also more JPEG artifacts in the Canon shot, as evidenced by the inconsistent color of the wood siding. 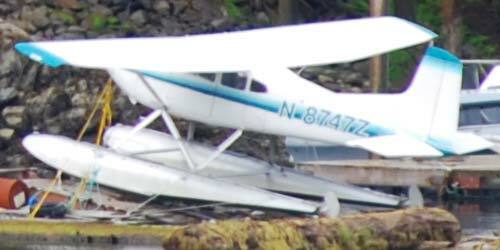 As you can see, at 200mm of zoom, the “N” number on the airplane parked in front of the home is clearly readable. 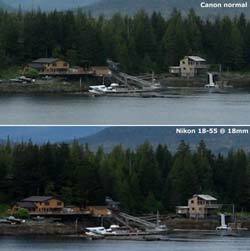 With the Canon in its max zoom mode, it was impossible to even tell that the airplane had an “N” number. 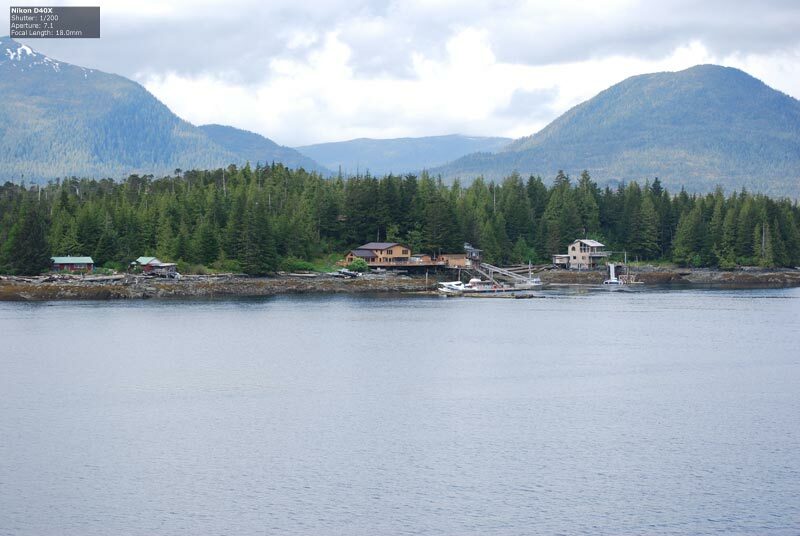 Zoom is a wonderful thing! As I admitted near the beginning, I’m now a digital SLR believer. The main downside, of course, is the size and weight of the gear one must carry about. The lack of a movie mode is also somewhat worrying, as I love being able to grab quick video clips. However, the benefits—much higher image quality, faster shooting speed, RAW mode, full camera control, and interchangeable lenses—seem worth it to me, at least for some excursions. 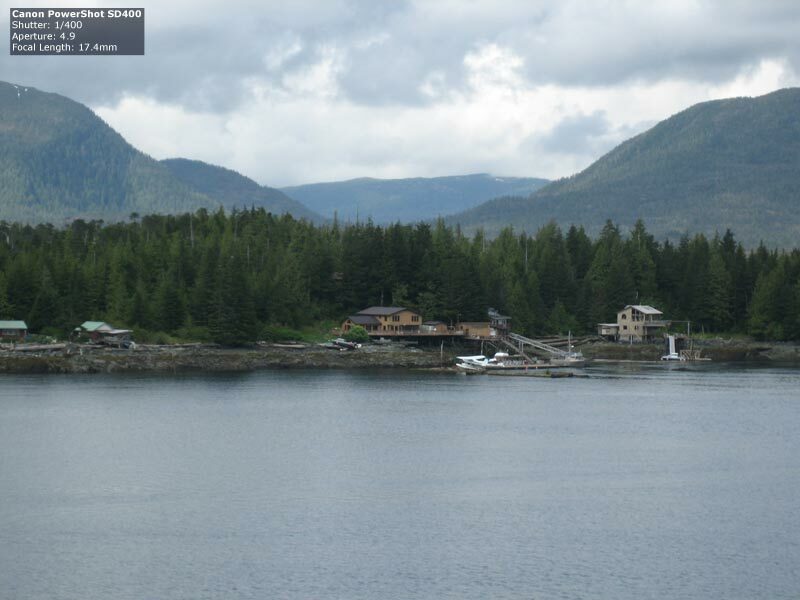 So when I returned from the cruise earlier this week, I checked the Glazer’s Camera Web site, hoping to reward their generosity on the cruise with a purchase. Unfortunately, the D40X was out of stock. I was hoping to get the camera before Apple’s Worldwide Developers Conference next week, as I’ll have most of a weekend day there to walk around San Francisco. Since Glazer’s Camera isn’t local (they’re in Seattle, I’m in Portland), I was going to go look locally, right after our bi-weekly Costco run. 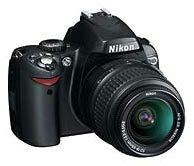 When we got to Costco, however, I was very surprised to find that they had a Nikon D40X kit for sale. The kit pretty much matched what I had used on the cruise—the camera, the same two lenses, a 1GB memory card, battery and charger, and a carrying case. It also included a couple of training DVDs (Understanding Digital Photography and Fast, Fun & Easy: Great Digital Pictures) and the Nikon PictureProject software and documentation. The fact that the D40X was available at Costco tells you a bit about where this camera is targeted—anything you find stacked on a palette at Costco is probably not targeted at professional users!